The director of the Cannes Film Festival has revealed he only agreed to show a vanity film about the history of football body Fifa after being personally lobbied by its French star. "Gerard Depardieu was very insistent," Thierry Fremaux told the Associated Press. "He really wanted us to show it." Fremaux had initially turned down United Passions, but eventually agreed to an open-air public screening on the beach. "At the beginning I said 'Out of the question', because the film lack[ed] the quality to be part of the official selection," he said. "Then they said, 'Why not on the beach?'. I said, 'Ah, the beach. Yes, it's a festival. It's football. It's the general public. Okay'." 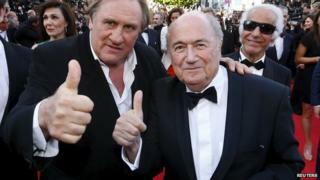 Depardieu attended the screening with then-Fifa president Sepp Blatter, who recently resigned from his post amidst the corruption scandal that has engulfed world football's governing body. Fifa largely paid for the £17m film out of its own coffers, only to see it mauled by the critics and flop at the US box office. The film, in which Tim Roth plays Blatter and Depardieu plays Fifa founder Jules Rimet, went straight to DVD in France and has been released in only a handful of other countries. However Fremaux refused to pour yet more scorn on the film, saying he did not "find the movie horrible at all".